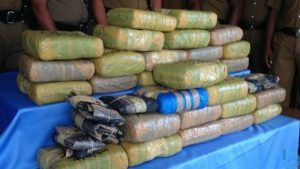 Jaffna News: Three suspects suspected of attempting to smuggle large quantities of ganja. The naval drugs were recovered from the navy when the Navy had checked a boat that was suspicious in the Point Pedro Sea. Three men were arrested on suspicion of attempted to kidnap it. The three persons were from Cotton, and were taken to Kankesanthurai Navy camp.